Lamb shanks is a meal just unusual enough to make a real impression at your next dinner party (just look at that well-caramelized crust!). You can get the heavy lifting out of the way the day before and just reheat the meat and sauce at the last. For the same reason, it also makes the perfect Sunday Roast/Sunday Lunch, that great British tradition. The Sunday Roasts of my childhood were usually beef (my father's favorite) or pork. Only occasionally would it be lamb (my mother's favorite). Since then I've encountered so much badly prepared lamb that I've quite gone off it! Then I heard from my favorite organic grassfed rancher (well, no, *he* isn't grassfed, but his cattle are!) in Wyoming that they now offer organic grassfed lamb humanely raised on a family farm and ranch in Montana. Rocky Mountain Organic Meats, a great company you've read about here before, sent me the four lamb shanks. Not wanting to waste this very special meat on people who wouldn't fully appreciate it, I polled my friends who are into organic grassfed meat to see which ones especially like lamb. I chose well! The happy recipients loved the flavor of the wine-braised lamb and the falling-off-the-bone tenderness of it. If you've never cooked lamb, be prepared for its distinctive smell. Some people (such as the friends I was cooking for) will walk into a kitchen where lamb is cooking and think it has a heavenly aroma; others (such as myself!) will think it has a gamey odor. Which camp are you in? Are you a lamb lover? Rocky Mountain Organic Meats is going to ship 4 organic grassfed lamb shanks to one of my readers! Will it be you? See bottom of the post for giveaway details. For your convenience, the organic grassfed lamb shanks and other Rocky Mountain Organic Meats can also be ordered through Amazon! Make day ahead so you can chill the braising liquid and easily remove the layer of fat. 1 Heat oil in heavy pot large enough to hold the lamb shanks in a single layer. I use a 5.5-quart Le Creuset round French oven and brown the shanks two at a time (and later set them on their narrow sides to fit into the pan for braising). Sprinkle the first side of the 4 shanks with 1/8 teaspoon salt and 1/4 teaspoon pepper. Add to hot oil and brown well, turning occasionally, about 10 minutes, sprinkling second side with 1/8 teaspoon salt and 1/4 teaspoon pepper. Remove to platter. 2 Add onion, carrot, celery and garlic to pot. Sprinkle with 1/4 teaspoon salt and 1/2 teaspoon pepper. Brown the vegetables, stirring occasionally, about 20 minutes. Stir in the Worcestershire sauce, herbs and tomato paste; cook for 1 minute. Stir in 2 cups wine and broth; bring to a boil. 3 Preheat oven to 325 degrees. Add lamb shanks to pot, and return to the boil, adding more broth or water if the shanks are not halfway submerged. Cover pan with foil and lid; simmer in oven for 2 1/2 hours. 4 Transfer shanks to an oven-to-table casserole. I use a 2.5-quart oval CorningWare casserole. Strain braising liquid into a 4-cup glass measure, pressing out liquids from solids; discard solids. For easy removal of fat, refrigerate braising liquid overnight or long enough for the fat to solidify. Do not skip this step -- the braising liquid will be extremely fatty and must be thoroughly defatted. 5 Remove layer of fat from chilled sauce. In small sauce pan, bring the remaining wine to the boil; reduce by a third. Stir in the defatted sauce. Taste and adjust seasoning. Pour over shanks in casserole. Refrigerate until one hour before serving time. 6 One hour before serving, heat covered casserole in preheated 300-degree oven for 1 hour. 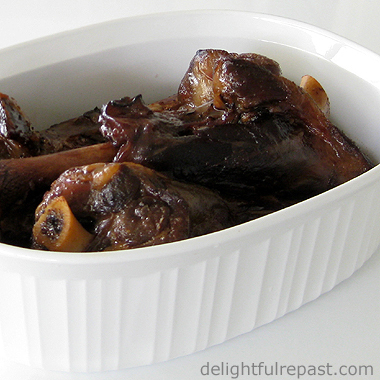 One winner will receive 4 grassfed organic lamb shanks from Rocky Mountain Organic Meats. All continental US residents who leave a comment (one entry per person - and please include your email address in the body of your comment) on this post before 11:59 pm Eastern time Wednesday August 7 will be put into a random drawing. Winner will be announced here in the comments before noon Eastern time on Thursday August 8. If I don't hear back from the winner of the random drawing by 11:59 am Eastern time Sunday August 11, another drawing will be held and a new winner selected from the original entrants (those who commented before the giveaway deadline). Disclosure: Product was sent to me for review purposes. I was not required to post about it and received no compensation for doing so. And, in case you don't know me, there is no amount of money or free product that can induce me to say something I don't mean! I have never eaten lamb in my life. (Remember all the cute sheep photos on my blog??) :-) But I'd probably eat it if you made it for me, Jean. Aww. I don't eat it either, Judy, but my friends enjoyed it! Just popped over from Belleau Kitchen and enjoyed your latest post on lamb. Lamb is one of my favourite roasts and is so versatile. Love those shanks although not as cheap as they use to be. I remember when I use to buy them for my dog! Not any more. Thanks, Magnolia! I'm sure lamb is very popular in Melbourne. I've heard shanks referred to as a "bargain" before, but I don't know why - they're certainly not cheap here, especially the organic grassfed ones - quite a luxury, actually. Jenn, I wonder how everyone's "smellers" can be so different?! Yum! Would love to try this. Peggi, thank you! Hope you will. I don't eat lamb either...but this looks so good that I want to give it a try too. Boy, those lamb shanks look tender and delicious! I love lamb but strangely, have never cooked it before. I've only had it in restaurants. I do find it a little gamey but I like it anyway. 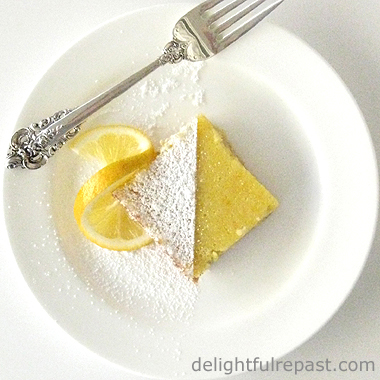 I bet this recipe would go well with a good Pinot Noir! Thanks, Angie. If you do cook some lamb (and try it yourself! ), let me know if you liked it. All I have to say is it HAS to taste better than it smells! Richard, maybe if I'd had a few glasses of pinot noir while I was cooking ... :D Anyway, since you like lamb, you should definitely give this a try and let me know how it turns out for you. Thanks, SippitySup! You are a more adventurous eater than some! Nikki, I think most people I know who eat lamb have it mostly on special occasions - it can be pretty pricey! Thanks, Joanne! I think organic is especially important in meat with a lot of fat. Thanks for the great contest! I haven't tried lamb shanks before but this recipe looks like something I would really love to try. Thanks, Amanda! Hope you can try it soon! Thank you, AnnaZed. I think the whole rosemary-lamb thing has become a cliché! We always had roast leg of lamb for Easter when I was growing up - I always thought the smell coming from the oven was delightful! I am all for humanely raised meat. That would be a nice gift for him! Which of you would do the cooking? *Giveaway Winner Announced* - The winner, by random drawing, of the organic lamb shanks is Jenn S. Jenn, as soon as you send me, delightfulrepast at aol dot com, your name, address and phone number (required by shipper), RMOM will ship the shanks to you. Congratulations! If I don't hear from the winner of the random drawing by 11:59 am Eastern time Sunday, August 11, another drawing will be held and a new winner selected from among the original entrants (those who commented before the giveaway deadline). Watch for my next giveaway! In the meantime, follow me on Google and Twitter (@delightfulrepas). You can even use the Follow Me By Email button in the right column. I've got lamb in my slow cooker right now & the smell of that plus the look of your shanks is making my stomach go mad! :) Hahaha! Delicious, Jean!